The shot itself is really a difficult one for Magnus Eriksson. He has momentum taking him forward while he should be trying to chip the ball over both defenders he instead attempts to drive the ball over the defenders. l love how on the counter attack Eriksson goes straight at the goal. He has a pocket of space vacated by the full back but see’s Danny Hoesen and chooses to tucks inside. 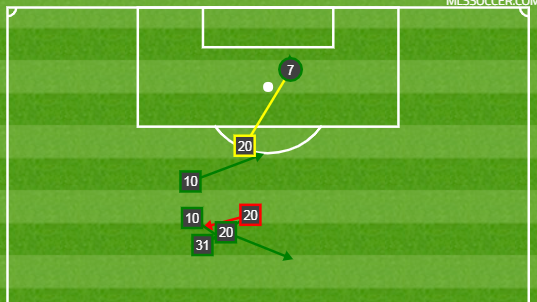 The problem is after providing service to Hoesen he doesn't make a near post run, he just... kind of slows down and doesn’t do much of anything. The pass at the front post basically goes to no one, since Eriksson doesn’t really find it worth his time but does end up working out as a chance is created with Alex Bono deflecting the ball past former San Jose Earthquake Jose Hernandez, right into open space and an oncoming Eriksson. I love this big handed save by Jeff Attinella. Even Dikembe Mutombo would be proud. Zoltan Stieber's quick identification of the defensive line followed by his run is awesome. The pass by Ulises Segura is just the cherry on the cake. The only thing that doesn’t come off is the shot, which is just straight denied by Attinella. I published a piece on wingers yesterday and one of the things that often gets missed about Romell Quioto is that he’s similar to Alberth Elis in a lot of ways. He’s not as selfish and he has more of an aptitude for creative play. But the dude can get on the end of balls and create high leverage opportunities too. He doesn’t miss this by much and it’s easy to wonder how the game changes with the goal being scored. Quioto gets to this ball though because Jefferson Savarino is mispositioned. But his identification of Quioto being wide open and isolated on the far wing probably prevents and easy tap-in. That run 50 yard run is huge and probably game saving. Sometimes shots don’t look dangerous because either they’re taken nonchalantly or there looks like there is no effort. Here you have both situations. Romney makes a bit of an extra effort on awful cross by Ola Kamara. Honestly, I’m down right stunned by how awful it is. This cross should, very probably, go out of bounds but it oddly enough doesn’t and Romney gets position on the ball and heads it into the box where there is just no one there but Daniel Steres. Steres has time for it to drop, settle and then have a swing. The shot should be better. The effort should be better. Stefen Frei should be at least troubled to make a save or even forced to move. I think most of the takes by announcers on “having to score” or “should have scored” in specific situations are garbage takes. We know that on average this type of attempt is scored over 50% of the time. But putting a shot on target in this situation is even more probable than scoring and just that save could lead to a chain of events which creates another high leverage opportunity. 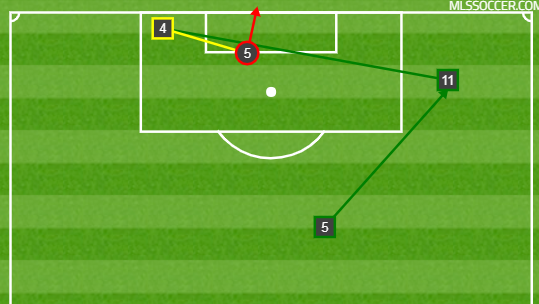 The first touch by Luis Silva complicates the progression and limits the opportunity for a shot by Jefferson Savarino. Savarino gets a poke at it but it’s Joe Willis whose approach is perfect to stop the attempt from becoming a goal. It’s all a bit anticlimactic after the huge run by Joao Plata. And speaking of Plata, I love this run/carry by Plata. Once he approaches the 18 yard box though he is presented an choice, either the opportunity to push the ball wide with the overlapping run by Damir Kreilach or to put the ball into zone 14 and Silva. There are a few models out there that could speak more to the decision making and the value between the two decisions. For me, without the benefit of such data, putting the ball into the middle of the park is the best possible move with runners on the outside and a drop option available but I see a lot of player's move that ball wide in order to set up a cross into the middle of the box. This perpetually drives me nuts. Despite this high leverage opportunity unraveling I’m happy to see the effort being made to do the right thing.